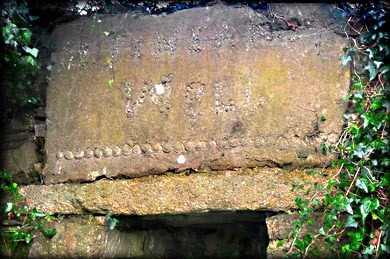 The ancient well in Newcastle Farm townland is dedicated to St Finian of Clonard. Finian was known as "The teacher of the Saints of Ireland". This is a spring fed well, enclosed in a lintelled granite house. The well seems a little neglected. The water was flowing out from the well house, but this may be normal during the winter months. I don't know of any pattern being held here, and there were no votive offerings present during my visit. Locally there are a few stories about cures associated with the well. Situated: From Newcastle, head south for Athgoe on the L6001. After a few hundred metres take a right turn for Lyons. 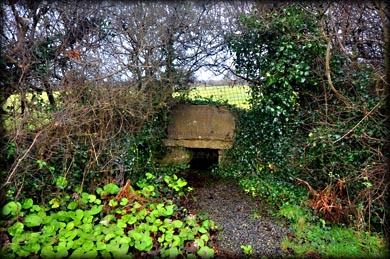 The Well in hidden in the hedgerow about 250 metres down here on your right beyond the cottages. Discovery OS Map 50: N 9920 2850. Last visit Jan 2018.